1-3. If you have abs as stunning as Rihanna’s then you can really go short on your crop tops. Pair them with boyfriend jeans and a boxy sparkly top, pair your joggers with a crop sweat or go the fitted way with an elegant crop top and a fitted maxi skirt. 4-6. If you don’t have the perfect abs, you can still style crop tops elegantly with high waisted bottoms. 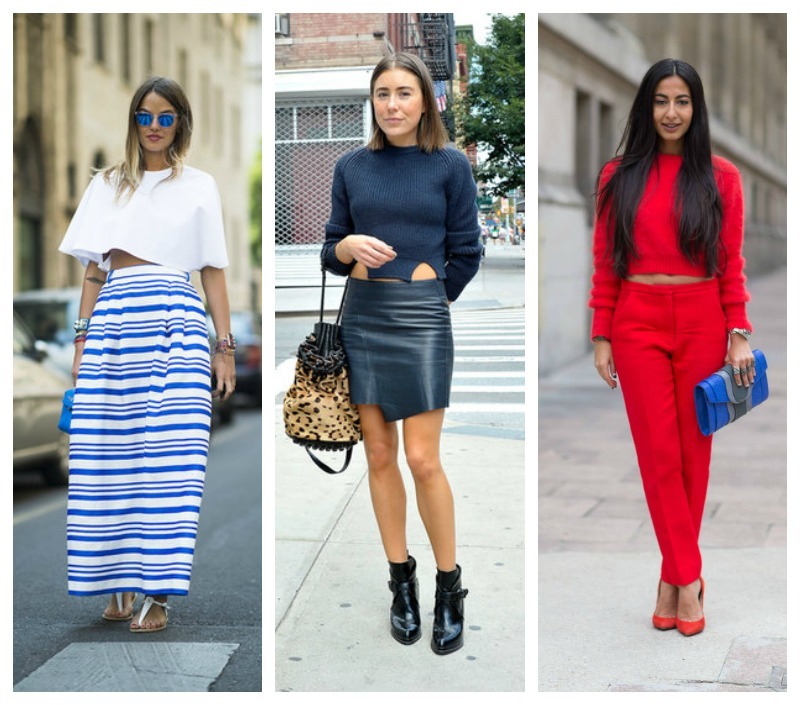 Go monotone with with a crop jumper and a high waisted trousers. 7-9. 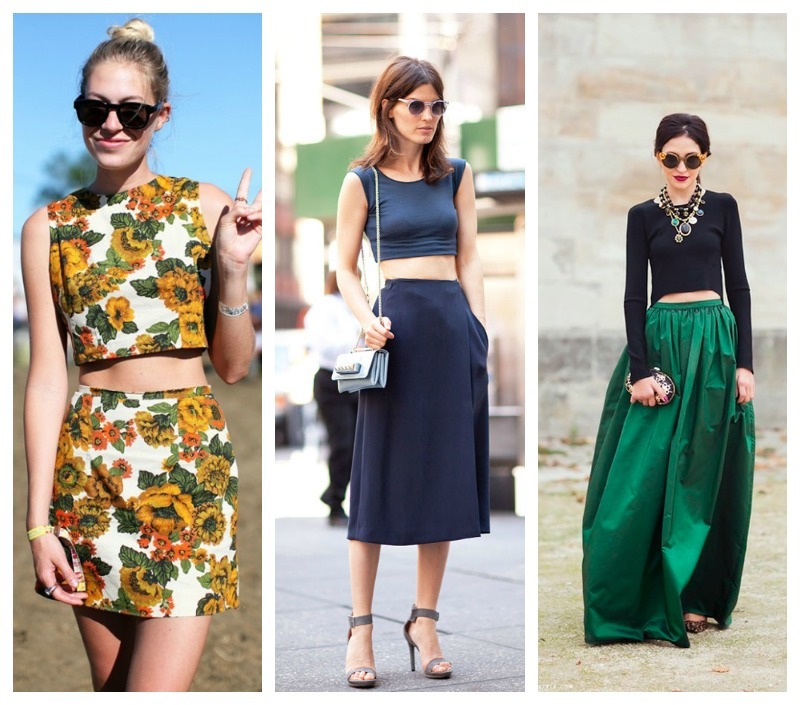 Crop tops work with all kind of skirts – mini, midi or maxi. Just make sure that your skirt is not too tight on the waist. it should sit just right. 10-12 Take clue from our Bollywood celebs. Go the Kalki way with relaxed bottoms or Sonam Kapoor’s and Neha Dupia’s way with skirts. 13-15 You can also pair your crop tops with different style trousers – wide legged, high waisted jeans, peg leg trousers. 16. You can also style your crop tops with palazzos. 17. Loved the styling of a fitted cropped tank top with overalls. This entry was posted in Styles and tagged bollywood crop tops, crop tops, how to style crop tops. 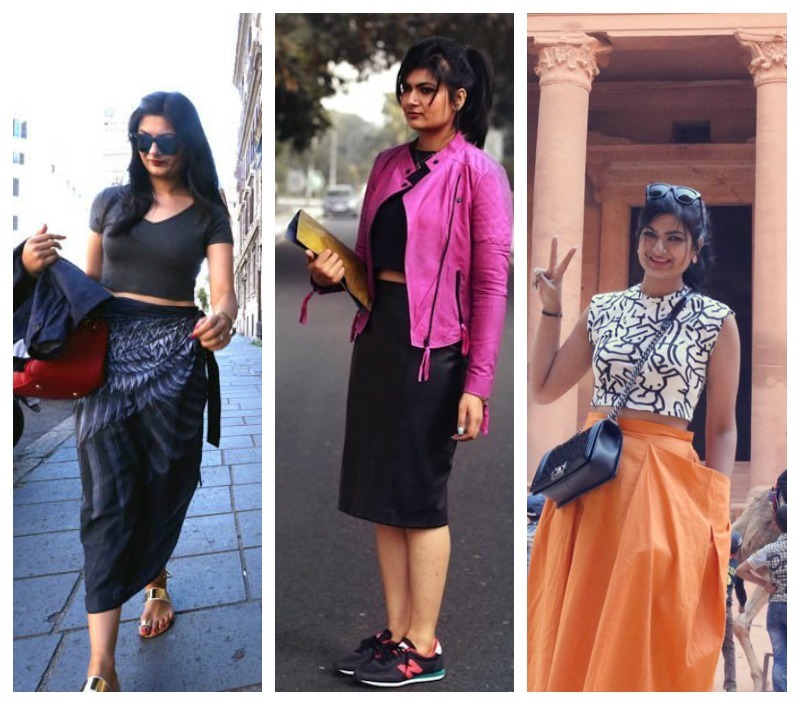 crop tops street style, Indian fashion blog, Indian fashion blogger, indian style blog, rihanna crop tops. Bookmark the permalink. My my…. I just fell for that lady in pictures 18,19 and 20….. I pair my Crop tops with Sari’s as well. They look superb in Solid colors and contrasted Sari. Oh wow.. Thanx for dis post Rati.. The last pic of urs is awesome! I usually style it wid pallazos n midi skirts! Loved all d styles…. you orange skirt and crop top look is one of my favs!! I do have to loose love handles before crop top endeavors! the best for the last always..just relate better to you I guess..:) flat abs an absolute must..